How many nappies are binned each day? One Day: How Ireland Cleans up - In Numbers. Irish households produce a staggering 7,500 tons of waste every single day. As a nation, Ireland disposes of one million dirty nappies, bins 220,000 plastic bottles and chucks away half a million takeaway coffee cups every day of the week. It's not all just single-use packaging and products either. The value of food that is wasted in Ireland is whopping €3 million daily. We also flush away 400 million litres of water, which contains enough waste paper in it for 519,000 toilet rolls. What does a typical days work look like for the people that keep Ireland clean? At 5am every morning, bin-lorry driver Jonathan Dennehy dodges the busy Cork city traffic to lift 2,000 domestic bins. "There’s no point giving out about it. At school, I was known as a smiler!" Jonathan says about his daily task. As the morning rolls on, come 10am, the fearless Emerald window cleaning crew are suspended by ropes from the 11th floor of Dublin's George's Quay Plaza. It's the beginning of a 3-day cleaning operation that the crew takes in their stride, bar the odd attack by an angry seagull. 12-Midday and at Dublin's Waste To Energy Incinerator, that runs 24/7, shift supervisor Robert Andrews overlooks the vast tipping hall, where 100 trucks offload their waste collected from around the capital. 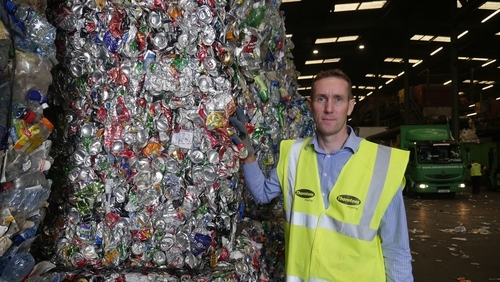 In his job, Robert sees the reality of our waste problems, "working in places like this really opens your eyes to the amount of waste we produce in the country". It's 3pm at Woodlands Hotel in Adare, Co. Limerick and the house-keeping staff are busily getting rooms ready ahead of guests arriving for a wedding banquet. Cleaning supervisor Fiona Dawson is all too used to cleaning up after a late night revelers -"you’d know straight away it was a wedding, there’s fake tan and make-up all over the bed linen". 7pm, and for some, the day's work is just beginning. The evening shift at Thorntons Recycling Depot are busily sifting through a conveyor belt of green-bin waste. They have to remove nappies, food and other non-recyclable material. Thornton's David Duff says of the process; "that’s not a mistake. Some people put food in the green bin to cut down on costs and then someone has to hand-pick through it. People are not aware of the human involvement in waste". It's easy to be blasé about our waste, but when you peak behind the scenes and see the shocking figures, it's hard to ignore.